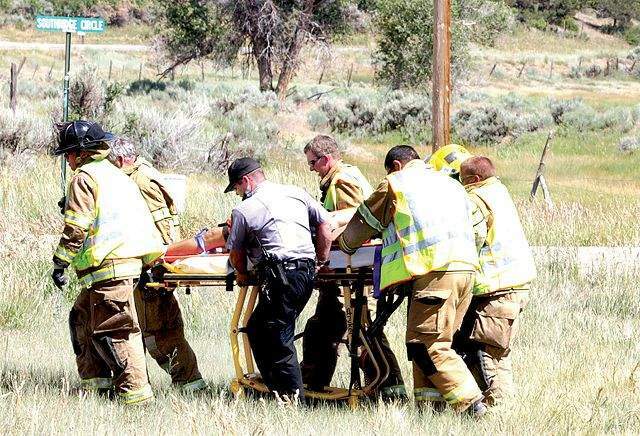 Medics and firefighters carry the driver involved in a dirt bike accident on County Road 223. State Patrol Trooper Stephanie Clewley said that at approximately 3:20 p.m. Wednesday afternoon, a rider on a Yamaha 450 dirt bike was traveling eastbound. The cause of the crash and the speed at which the bike was traveling was unknown. The driver was taken to Mercy Regional Medical Center.